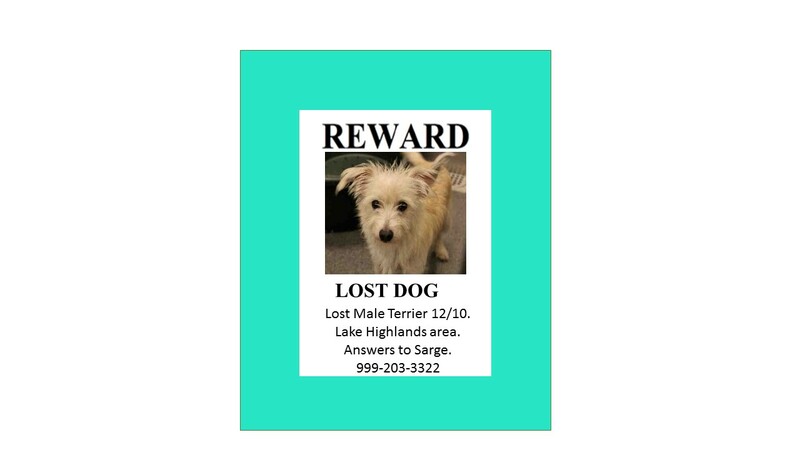 Create flyers to hand out toto hand out to neighbors and place in key locations like veterinary offices, pet shops, groomers, post offices, and outside supermarkets in your area. 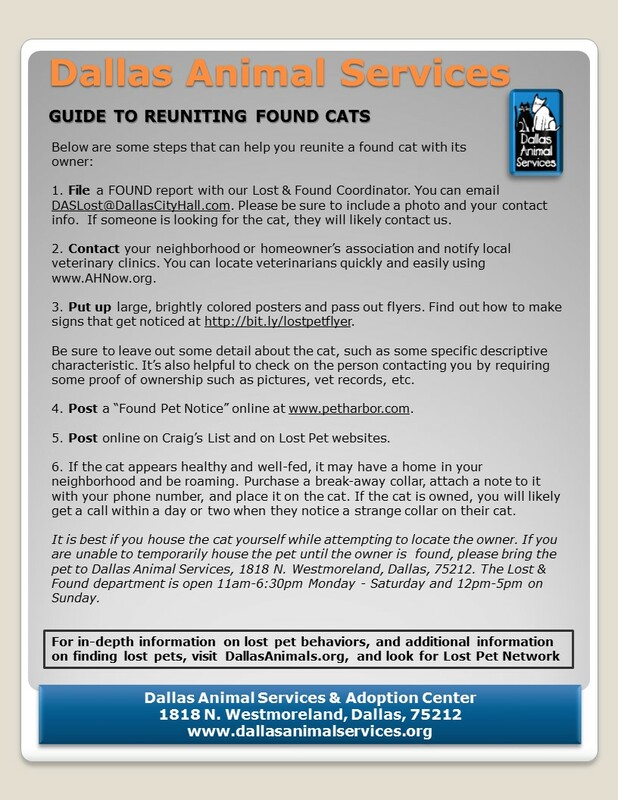 You will need to make plenty of lost pet flyers (at least 75 to 100 initially). You’ll want to leave a few with your local shelter and find out how to mail or fax them to all of the local breed and nonbreed rescue groups in your area. If you’re not sure how to contact the rescue groups in your area, ask the staff at your local animal shelter as they typically keep in touch with these nonprofit organizations. For flyers, always use the best picture of your pet, preferably a color photo showing the entire pet – the larger the photo, the better. Place the photo in the center of the flyer. Be sure your flyer includes details such as your pet’s breed, coloring, hair length, any distinctive markings, whether it was wearing a collar, and the location and date the pet was last seen. If your pet is timid, add that information to your flyer. Include a phone number where you can be reached in big, bold numbers and encourage calls anytime day or night. 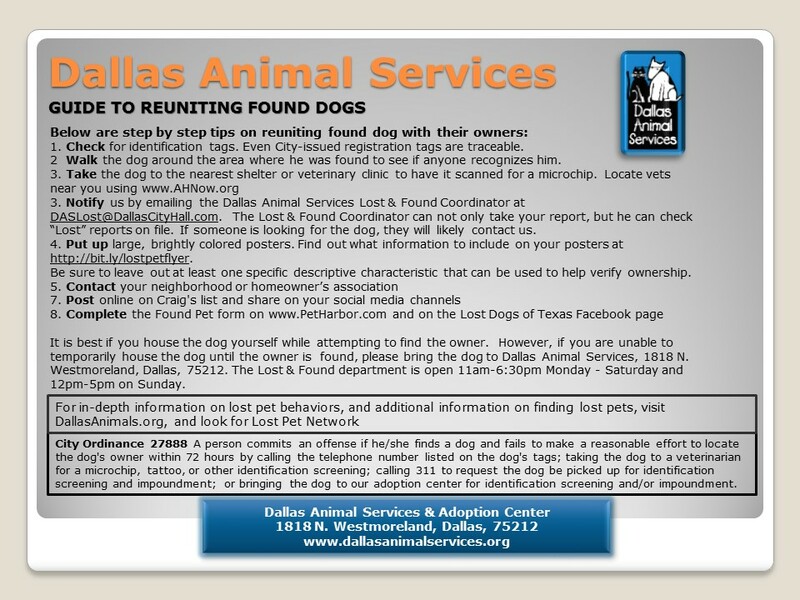 Use a very brief description of your pet at both the top and bottom of your flyers. Use the largest font that you can – such as size 80 or 90 in Arial or Verdana font and write “REWARD LOST DOG” or “REWARD LOST CAT” at the top. 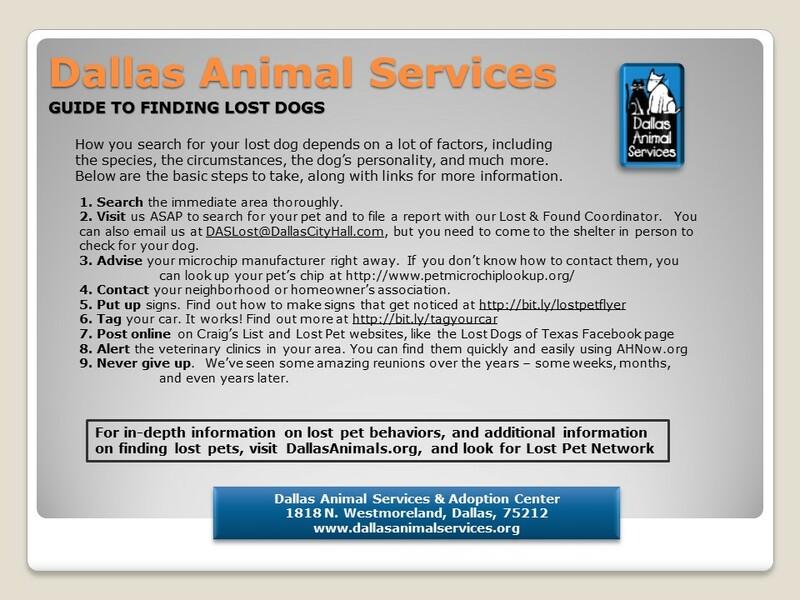 Include just a few sentences describing your pet, where it was lost, and phone numbers where you can be reached. In the center of the flyer paste a color photograph of your pet. 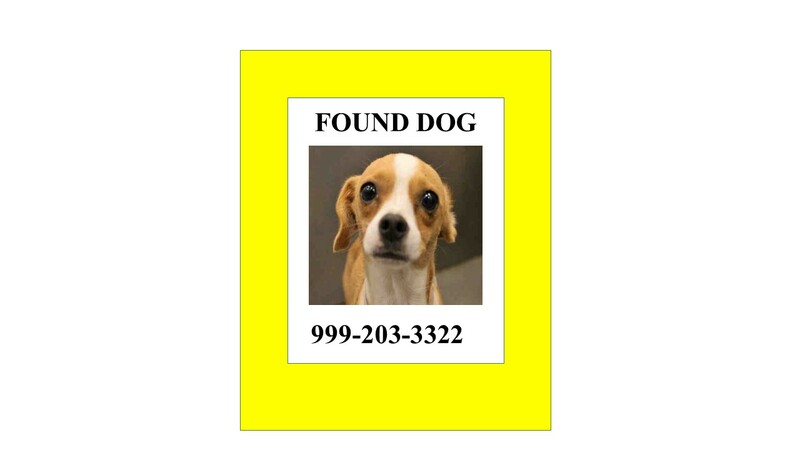 When creating flyers and placing ads in the local Classifieds section, it is important to withhold at least one identifying mark or characteristic of your lost pet, in case you need it later to verify that a person has actually found your pet and is not trying to scam you – it’s unfortunate, but it does happen. For safety considerations, DO NOT include your name, your address, or a specific reward amount on your flyer! The type of people that you hope will call are animal lovers who don’t care about the money – not folks looking to make a quick buck. Whenever you go to claim your pet, be sure to take someone with you – and do not pay any reward until you actually have your pet back. If someone asks you to wire money because h or she found your pet but is now in a different city, DO NOT BELIEVE IT, as this is a common scam. Do not post flyers as they are too small to be seen by someone driving by. Instead, use your flyers to make large, flourescent posters. See below for details. Make them GIANT so that people driving by cannot miss them. Make them FLUORESCENT so that the color attracts the attention of everyone. 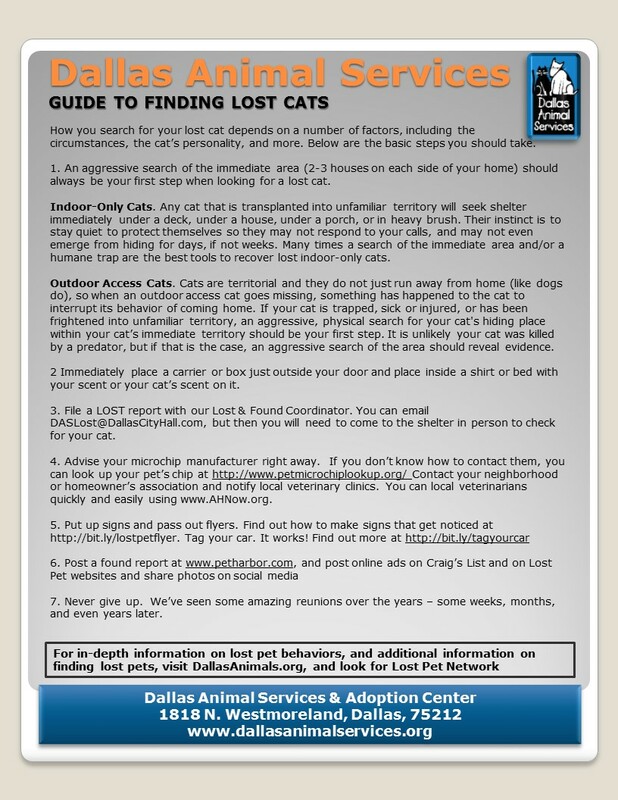 Put them at major intersections near where you lost your pet (and in areas of sightings). Keep them BRIEF and to the point. Let them convey a VISUAL IMAGE of what you have lost. 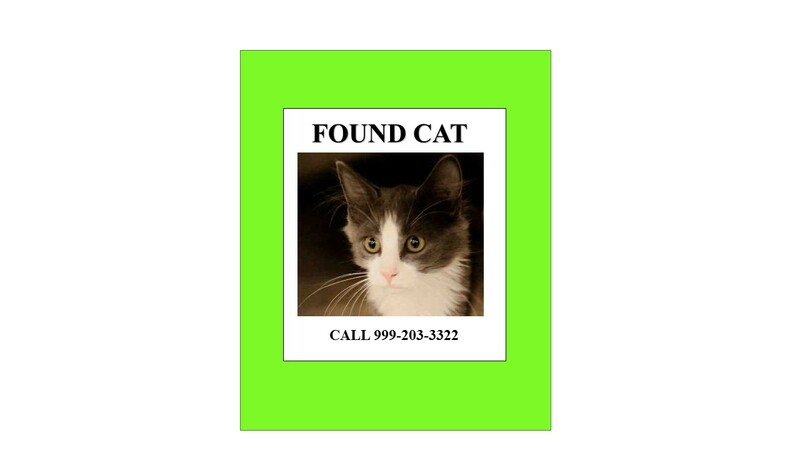 For Found Dogs or Cats– Post a giant FOUND DOG poster near the exact spot where you found the pet and a couple more at major intersections in that area. Use florescent posters that are 28″ X 22″ in size (found at most office supply or drug stores). Using a wide black marker (do not use water soluble markers), write five or six words that convey your message, then put your phone number in smaller writing at the bottom. For example, if you find a white teacup Poodle, you could write: “FOUND TINY WHITE FLUFFY DOG” and your phone number. That’s it. Don’t be too descriptive. If someone calls to claim the pet you found make THEM tell YOU what their missing pet looks like. 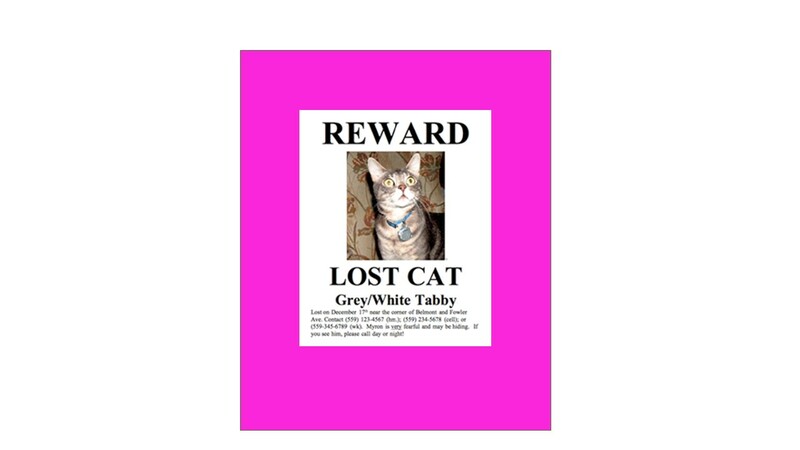 For Lost Dogs or Cats– Most pet owners post lost pet FLYERS that are 8 1/2″ X 11″ white pieces of paper and the only message conveyed is REWARD LOST DOG or REWARD LOST CAT. These are too small and very few people passing by even notice these. Even if drivers did manage to see the words “LOST DOG” very few will pull over to read the description of the lost pet. If instead you create a highly visible poster that conveys the message “REWARD LOST DOG–YELLOW LAB” or “REWARD LOST CAT–SIAMESE” or “REWARD LOST DOG–TAN TERRIER RED COLLAR” that every person driving by could quickly read, you will increase your probability of developing leads that will help you find your pet! Here’s one last suggestion. If you’re able to find them, duct tape your fluorescent posters to A-frame campaign signs and stick them in the ground near busy intersections. Because you won’t need to rely on finding a telephone or light pole, you can simply push the metal frame into soft dirt or grass. Be sure to duct tape the top of the campaign sign near the top of the fluorescent sign otherwise the wind can blow the top (“REWARD”) portion back making the sign hard to read. In the photo below, did you notice the second sign? It is on the opposite side of this six-lane road capturing attention of traffic heading in the opposite direction. Again, the fluorescent color and size of these signs along with the five-word description (REWARD LOST DOG WHITE POODLE) has resulted in the recovery of many lost pets!